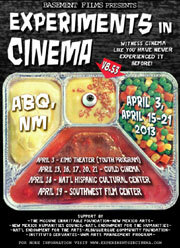 As of this posting, Experiments in Cinema v.8.53 has been rocking Albuquerque, New Mexico with another lineup of fantastic experimental short films, but there’s still time to catch some amazing stuff over the next several nights. The entire festival runs April 15-21 at the Guild Cinema and other locations around the city. For example, tonight, April 17, there will be three short film programs that will include new work by Underground Film Journal favorites Neil Ira Needleman, whose A Charming and Quaint Tale of Brutal Revenge is another “possible documentary” excursion into the filmmaker’s fevered brain, and Clint Enns, who reworks a Kurt Kren film into just the Splice Lines. Fantastic animator Ben Popp will lead a hand-processing workshop on the morning of April 18 where the work produced there will screen two nights later. Then, on April 19, Caryn Cline will lead another workshop on making films out of environmental material where the work will also screen later in the fest. April 19 will also feature two special curated short film blocks. For the first, Ekrem Serdar will screen experimental films from Turkey; which will then be followed by Bart Weiss presenting selections from the Dallas Video Festival. Finally, the night will conclude with Jodie Mack‘s latest animated semi-feature rock opera Dusty Stacks of Mom. Then, April 20 will include new work by other Journal favorites Sylvia Schedelbauer and Thorsten Fleisch among it’s power-pack of three short film blocks. And the fest will conclude on April 21 with a block of environmental-themed shorts curated by Caryn Cline and Julie Perini and another block of short films that includes Ben Popp‘s own Binary. 6:00 p.m.: Free Radicals, dir. Pip Chodorov. A tribute to avant-garde and experimental filmmaking’s rich history, including such luminaries as Len Lye, Stan Brakhage, Maya Deren, Maurice Lemaître, Robert Breer, Ken Jacobs, Jonas Mekas and Peter Kubelka. Filmmaker Ben Popp leads his workshop where participants will craft their own film that will then be shown during the festival. Filmmaker Caryn Cline will teach this workshop on making films in the tradition of Stan Brakhage‘s Mothlight. Dusty Stacks of Merch, dir. Jodie Mack. This animated rock opera charts the fall of Mack’s mother’s poster business.